While we don’t spend much time thinking about it, our gums are essential to our overall health. According to conservative reports, 80 percent of the population unknowingly carries some form of gum disease. Since gum disease can lead to more serious ailments including strokes, heart attacks, and pregnancy complications, you’ll need to learn preventive tips from your dentist in West Monroe. The complications that can occur from gum disease are serious, but regular oral healthcare can stave them off for good. For too long, the relationship between oral health and overall health has been disconnected. Maintaining oral health is essential if you intend to stay healthy overall. To simplify, think of your gums as a window into the rest of your body for bacteria to pass through. The unhealthier your gums are, the wider that window opens, making you more susceptible to infection and other health complications. Poor gum health also has the potential to reduce the effectiveness of your immune system, making you susceptible to common sicknesses. Furthermore, the best way to avoid the “silent killer” that is gum disease is through preventive care. Oral health always starts at home with regular brushing and flossing at least twice a day with a fluoridated toothpaste. When brushing, be sure to pay attention to the gumline just as much as your teeth. Floss at least once a day to remove plaque from places your brush can’t reach. A mouth rinse can also reduce plaque up to 20 percent, so it doesn’t hurt to include that as well. Avoid tobacco products as much as possible as these contribute heavily to gum disease and oral cancers. Avoid starchy and sugary foods which build plaque and replace them with foods rich in vitamin A and C which prevent gum disease. Keep in mind what medications you’re taking as well; oral contraceptives, antidepressants, and heart medicines can aggravate gum disease. Once your oral routine and diet is accounted for, you’ll need to schedule an appointment with your dentist in West Monroe so they can give you a professional screening of your gums. The American Dental Association recommends dental visits every six months to ensure your oral health is in check. During their examination, the dentist will observe the color, texture, size, and shape of your gums. 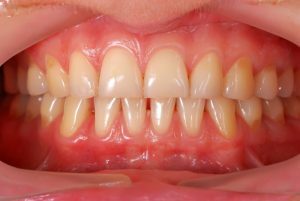 If your gums are firm and pink, they are most likely healthy. However, diseased gums that are reddish or bluish-red in color could be a sign of infection. If they are puffy, spongy, enlarged, swollen, or shaped differently than what is normal, your dentist may diagnose you with periodontitis (gum disease) and recommend you necessary treatment. Your dentist will also note any missing teeth and the depth of your periodontal pockets. The deeper these pockets are, the larger sign it is for gum disease. Don’t let gum disease affect your overall health. Schedule a dental checkup with your dentist in West Monroe today! Dr. L. King Scott, D.D.S. earned his Bachelor of Science degree from Northeast Louisiana University before eventually earning his Doctor of Dental Surgery degree from the Louisiana State University School of Dentistry. During his decades of dental practice, Dr. Scott has taken thousands of post-graduate education from the finest dental professionals in the industry to provide the highest quality care possible. To learn more about him and his practice, contact him at (318) 325-4600 or visit his website.